Amy Vidrine has a BS in Microbiology, and it’s all Richard Preston’s fault. Amy’s high school biology teacher read the opening chapter of The Hot Zone in class, and she became hooked into microbiology from then on. She’s been in research laboratories for over a decade and is now a laboratory manager. She has followed the Ebola outbreaks (as an armchair epidemiologist) since the 90s, and has plushie versions of Yersinia pestis, Ebola, the “Mars bacteria,” and the T4 phage. In other words, she’s pretty nuts about microbiology. 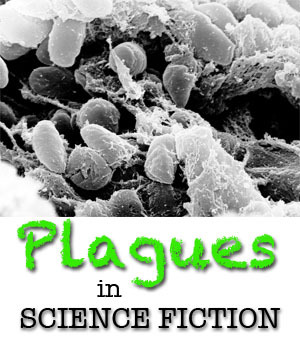 Plagues are a common SFF plot trope, either as a main source of tension and plot or as backdrop. They can range from Crichton’s alien La Linea Verde de Muerte (also known as the Andromeda Strain) to G.R.R. Martin’s greyscale to Rowling’s somewhat amusingly-named Spattergroit. The range of symptoms, like real plagues, can vary from deadly and horrid to merely annoying. The problem comes in when these plagues reach too far into science fiction and become merely fiction (i.e. no basis in science). Of course, magical (and possibly alien) plagues will have their own rules, but if you want your science fiction to be more than merely fiction, you may want to keep reading. While browsing through a list of fictional plagues for some background research for this article I noticed something interesting: most fictional plagues are viral. While it is true that science has yet to come up with completely effective treatments for viral diseases, not all deadly diseases are viral. The flu probably holds the record for deadliest disease in history, but one of the most horrifying diseases we have is the Black Plague, and that was caused by the lowly bacterium, Yersinia pestis. Ebola (a virus) isn’t a picnic, either, but Ebola has killed less than 15,000 people. The Black Death killed roughly 25 million people. That’s a lot of people, but it was nearly a third of Europe’s population at the time. Imagine what it would be like to live through a time where 1 out of every 3 people you know succumbs to a terrible plague that has no cure. And the Black Death still kills people, even in this age of antibiotics. And with the way antibiotic-resistance is going, bacteria are poised to make a comeback as a force to be reckoned with, so don’t rule out bacteria as a source for your plague. A lot of fictional plagues only kill off certain “undesirables” in the fictional world, like Hendee’s Codon Zero (which itself has other problems) that only infects Arabs and Jews, or kills only adults (Čapek’s White Disease), or kills only women (Herbert’s White Plague). I’ve got news for you: if a disease can infect one part of a human population, it can infect all of the human population. Variation in lethality could be caused by variations in immunity (caused by genetics) or by exposure, but generally speaking, any deadly virus can infect and kill any human. There are diseases that some people have a natural immunity to, but this is usually due to exposure over generations or exposure to a similar virus (like cowpox) and the passing of immunity on to babies from mother’s milk, not by any magical ability of the virus. Bacteria are also not picky about who they infect. There are diseases that affect certain populations, but these are genetically linked (like sickle cell anemia, beta-thalassemia, and Tay-Sachs, just to name a few) not viral or bacterial. Besides, it’s a documented fact that women have stronger immune systems than men (sorry, Frank). If you haven’t read my previous entry in this series, I encourage you to go do so now. We already have a lot of scary, deadly diseases, we certainly don’t need more of them. There are few reasons for scientists to engineer deadly viruses, though the viruses and bacteria we do have are researched for possible weaponization (I once heard a scientist claim that some Russian scientists mixed smallpox and Ebola, but the veracity of that is questionable). When scientists genetically tinker with viruses, it’s usually to put them to good use, as with lentivirus (like HIV). It is used in cancer research and gene therapy. The disease-causing portion of the virus has been removed or inactivated, and the NIH monitors lentivirus research very carefully to ensure that no HIV-like disease develops with lentivirus treatments. Here are a few tips for writing realistic plagues and pandemics into your fiction. If you want a plague, you need a way to get that plague to spread amongst your population. Thus, you need a means of transmission. Bacteria and viruses (and even parasites that cause spreadable, plague-like diseases like malaria) have hosts and a way to infect others to continue the life cycle. The way that diseases spread will completely depend on the type of virus, bacteria, or parasite you’re working with. Viruses often have reservoirs, a host that carries the virus but rarely gets sick from it, that can spread the virus through contact with other species, though viruses don’t need to go through reservoirs to spread from human to human. Viruses are actually fairly fragile and don’t last long outside of their host or reservoir (think minutes to hours, not days), so must be spread by close contact or by a short time in the air. Oh, and since the Ebola scare has everyone confused about what airborne transmission means, let’s go over that. Airborne means a virus can be spread just by breathing in the same air as someone who has the virus. They breathe out virus particles, you breathe them in. Boom, you have the flu. Ebola is not airborne. It can, however, be aerosolized, which means that when someone coughs, they spray droplets of blood or saliva into the air, which surrounds the virus and keeps it alive long enough to get into someone else’s eyes, nose, or mouth. Just being in the same airspace as them does not mean you will get it (unless they cough). Airborne viruses, like the flu and colds, are more easily spread than aerosolized viruses. Parasites, like malaria, often need an intermediary, like a mosquito, to spread from human to human. Bacteria live everywhere, and will happily live on a surface for hours, and, in some cases, longer than that. Some bacterial species can form endospores, which can last for centuries. Exceptionally lethal diseases that kill quickly are not, evolutionarily speaking, very useful. A parasite that kills off its host too quickly isn’t a very successful parasite because it kills its host before it has a chance to spread. One of the reasons Ebola hasn’t been more of a problem than it could be is its high mortality rate, the speed at which it can kill, and the difficulty in spreading it. Smallpox was so horrible because it had a lower mortality rate, spread more easily, and didn’t kill as quickly. Viruses typically do not take hours to incubate, either. It takes time for the virus to enter a cell, hijack its machinery, produce more virus, and get enough viral particles in the blood for the immune system to take notice and start the defense. That takes time – usually a few days, not hours. Keep everything you have read in mind when creating your virus. There’s nothing really wrong with coming up with a whole new plague that your characters must struggle through. But make it follow the rules (unless it’s a magical or alien plague…). It needs a method of transmission which is suitable for the type of organism. It shouldn’t kill off the host in hours. Also consider another type of organism, like a bacteria that is resistant to all of our antibiotics, if you want something truly terrifying. Or, for even more fun, try a fungus (look up Valley Fever if you are interested). Plagues can be a fun trope to play with in fiction, but make sure your plague hasn’t gone too far into fiction if you want it to be believable. Make your fictional plagues accurate enough to not make your scientist readers a little sick! I love it! I’d add #4: No cure is instantaneous. And as a corollary to #3, not all devastating plagues must infect people. In my science thriller novel PETROPLAGUE, bacteria infect the fuel supply of Los Angeles and turn all the gasoline into vinegar–a human catastrophe with no direct human deaths. I just read The Girl With all The Gifts – horrified me, and after reading this post I wonder how you’d rate it as a scientist? Very curious! Another great article in this series. Really appreciate the myth-busting and useful facts here. Thank you. This was terrific- thank you! Just wanted to say thank you for this article. I was having hard time developing a space born illness for a story i was contemplating. Thanks to this article I was able to narrow down the details for my illness until it was as realistic as I could get it. So thank you for writing this as it has helped me come that much closer to realizing my dream of becoming an author.